There are many types of crossroads and during your driving test, the chances are you will come across a few. This tutorial will provide you with an overview of the most common crossroads and how to deal with them. The most often used rule for crossroads is that a car turning right must give way. This is of course unless signs or road markings tell you otherwise. Most often located in quiet back streets in an urban area and also found commonly on narrow, quiet country lanes. unmarked crossroads have no road markings or road signs. As these types of crossroads are located in often quiet areas, they give the impression they are safe and easy to navigate. They are however often quite dangerous. As the crossroads is unmarked, neither road has priority, therefor extreme caution is needed on approach. As with T-junctions, left and right turns and roundabouts, on the approach you will need to assess if the roundabout is open or closed. An open crossroads is clear to see on approach as there is little blocking your view of the road you are entering. Unmarked crossroads can often be closed in urban situations. They are often obscured by trees, hedges and fences. If the crossroads is closed, extra caution needs to be exercise and lower speeds. As with roundabouts and junctions, crossroads need to be approached using the MSPSL routine. First you will need to look in the appropriate Mirrors, Signal, establish the correct Position needed for which direction you are taking at the crossroads, take the appropriate Speed based on open or closed, road markings or traffic lights and then finally Look to see if it safe to proceed. Marked crossroads will have road markings as in the diagram and may also have a give way sign. Priority will be defined by the road markings or road signs. 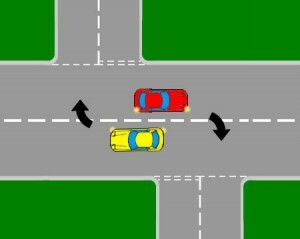 In this diagram, the red car needs to give way to the yellow car as cars turning right need to give way. When approaching a marked or unmarked crossroads and the intention is to turn left or right. If the road opposite to you is clear, exactly the same method will be used as though you are turning at a T-junction. The only difference being is that extra observations need to be taken of the opposing road to make sure it is clear. A slower speed may be required due to the extra observation as pedestrians and cyclists need to be taken into account as well as other road vehicles. During your driving test, the examiner may ask you to turn right at the light for example. As you are driving, you need to be looking well ahead for signs of what is coming. If in the distance you see come traffic lights, it may be an indication that there is a crossroads. As you get closer try to see if there are any cars crossing where the lights are, crossroads signs and road markings. By looking well ahead as seeing what is coming will give you plenty of time to prepare. Many driving tests are failed due to reaching a situation unprepared. Traffic lights determine who stops and who proceeds at controlled crossroads. 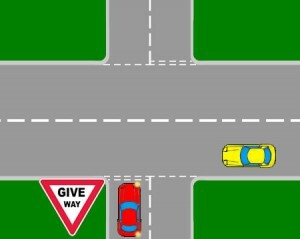 Remember, if you are turning right, you may need to be prepared to give way to oncoming vehicles because you are crossing their path such as the red car in the diagram. Ensure you don’t block their path making them swerve and stop at around your point of turn such as the red car. On occasions you may see a green filter light. If so, this means you will have priority over oncoming cars and their light will be red. All round observation must be made at all crossroads whether you have priority or not. Pedestrians, cyclists and other road users can be unpredictable at the best of times. Some crossroads have a yellow box junction in the middle. It is illegal to stop in these if your exit isn’t clear as you will block the entire road system. If you are turning right and there is a yellow box junction, providing your exit is clear, you can enter it and wait. 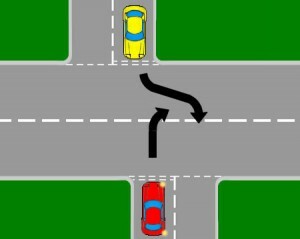 In this diagram, the yellow car is driving straight ahead and the red car is turning right. Remember cars turning right need to give way. 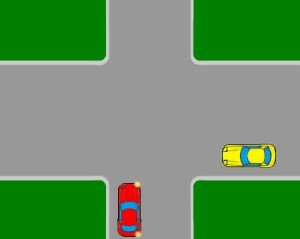 The red car needs to ensure he does not pull forward too far as to block the yellow cars path. At staggered crossroads although this rule still applies, it can be a little confusing as to who has priority. Use these rules but be prepared to stop if a car turning right does not appear to be slowing or stopping. At staggered crossroads, as a rule if you cannot see the road opposite, even if you are going straight ahead use of signals may be beneficial to other road users and pedestrians. A great many driving tests are failed due to lack of appropriate observation at crossroads. Crossroads are used by pedestrians to cross the road as well as cyclists. Being aware of these is essential, especially as cyclists can often ride through red lights. Younger cyclists may not know the rules of crossroads. If you intend to turn right at a crossroads ahead, you may also meet an oncoming vehicle that could be turning to his right. The most often used technique is nearside to nearside. Although the most common, it is in fact the least safest as the car you are turning in front of blocks your view of the road ahead. This technique may not always be appropriate however. 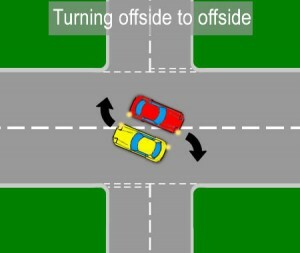 A staggered crossroads may be designed in such a way that turning nearside to nearside may be virtually impossible, if so, the offside to offside technique may need to be taken as in the diagram below. Beware also of large vehicles turning. The may require much more space to take the turn. You may need to slow down sooner and stop at an earlier position than normal to allow the large vehicle to turn freely. 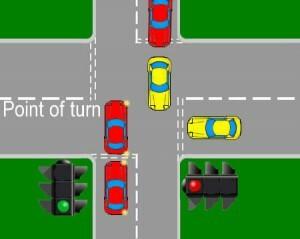 Another common mistake to make on the driving test and one that will result in a fail, is learners stopping in the middle of a crossroads when the lights change red. If for example you are turning right but waiting in the middle to give way to oncoming vehicles, the fact that you are in the middle of the crossroads means you are committed to completing the manoeuvre. This technique is very seldom used. Although quite rare, it is in fact the safest technique to employ. Turning offside to offside keeps the road ahead clear for you to see approaching traffic as the car you are turning behind of, is not blocking your view. Although safe, there are disadvantages to this technique. If for instance the red car is waiting to turn right but is unable to due to oncoming traffic, there maybe a queue of cars behind the red car waiting. If so, you will be unable to proceed until the queue of traffic has dispersed. Some crossroads have bay road markings to assist you on where to position your car when turning right. This is to ensure you do not position the car in such a way that it hinders the progress of oncoming traffic that you are giving way to. 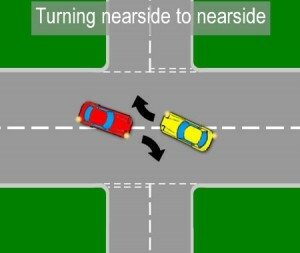 As mentioned above, the most common turning technique nearside to nearside would not be appropriate in this situation. It would make turning hazardous as it would require driving on the wrong side of the road for some distance. As you are approaching a crossroads all round good observation at vehicles and exit roads will help you decide on the appropriate method for turning and of course, some good driver training such as that provided by Cambridge Driving School will certainly provide you with the best possible chance of passing the driving test.